I am not a vegetable lover. That said, I do like to eat healthy and I know eating lots of veggies is a part of that. Because of that fact I do my best to make them taste good. When I discovered roasting them I was amazed at how it changed the taste from simply being steamed or sauteed. Roasting imparts a yummy slightly sweet and smokey taste that makes veggies pretty amazing. If you have never tried roasting your vegetables, you really should! And since I roast so many veggies I did a search on what type of pan is the best for roast vegetables. And you know what? According to Epicurious it’s the humble sheet pan! I love this Nordic Ware Natural Aluminum Commercial Baker’s Half Sheet. It has over 3000 reviews. But there are lots of choices to check out here. Also try my Roasted Cauliflower and Roasted Butternut Squash with Balsamic and Rosemary. 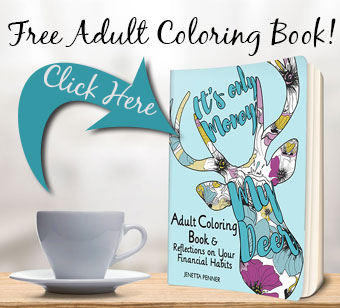 This is great, thanks for posting! What baking temp and time would you suggest for fresh green beans and not frozen? Going to try this for dinner. These taste delicious! I made them tonight with fresh green beans, and yes, it definitely calls for a shorter cooking time. :) Thanks for the recipe! thanks for letting us know... :) Glad you enjoyed them. I made this with fresh green beans along with sliced white mushrooms, tossing everything together - absolutely incredible. The mushrooms added a lovely smoky edge to the garlic and onion flavor. Thank you for saying you used fresh green beans and you thought they were incredible. I only eat fresh. I can not wait to try these! Can these be made ahead and reheated? Only asking because I'm toting Thanksgiving dinner to my parents' house, and it would be easier to carry the finished beans than all of the ingredients. Thanks! I have never reheated them. Where did the recipe go? I've made this before and my family loves it. Now the recipe is missing from the site. What temp/how long do I cook them for? Thanks! I made these tonight (2/28/2016) i didnt have onion powder so i used my food processor to mince up a little bit of real onion mix everything else as said and these are really yummy.... i think the real onion gives them a lot better flavor... was a hit with the Kids! oh no.. it's should not do that! I'm so sorry. So if using fresh not frozen green beans-cut roast time in half? It may be a little less time. But not significantly. If I had to double the recipe, how long would I cook for? I think it would be the same as long as you spread them out. Found you while looking for roasted green beans. Thank you. This looks like a good recipe! I’ll try it this week. 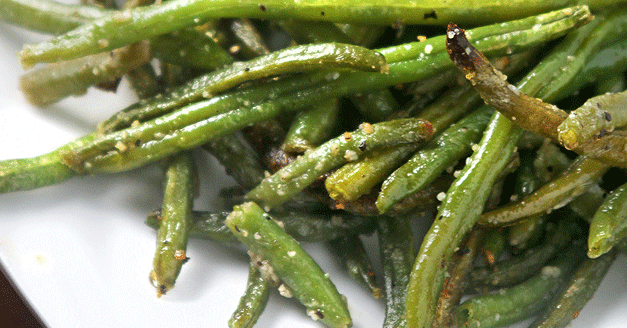 Why use frozen green beans when the texture and taste of fresh beans is incomparable. My boyfriend and I have made this several times and LOVE it! It's so easy, since all of the seasoning is stuff we always have in the pantry. It's a simple but flavorful side dish that goes with any main dish! 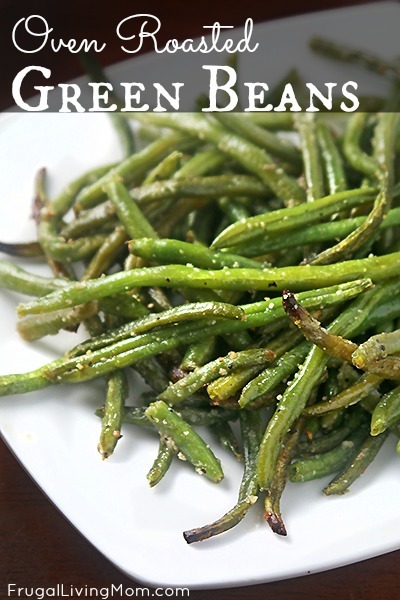 This is my third thanksgiving making your green bean recipe everyone loves them. They are soooo easy to make and they are delicious. Thank you for sharing this recipe. Happy Thanksgiving. I needed to find a recipe that gave me time and temp for roasted frozen green beans - someone mentioned this on another website but didn't give any specifics. I'm going to try using some Everything But the Bagel seasoning, I think the sesame seeds would be a great addition to it!